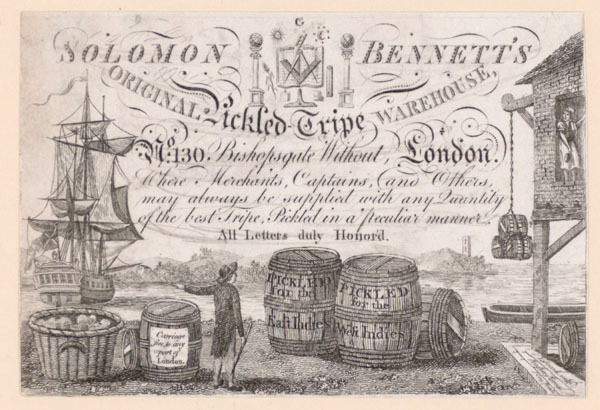 Solomon Bennett was a successful butcher exporting pickled tripe to the colonies from Shoreditch. Born in 1743 he married Mary Gaucheron at St. Leonard’s church Shoreditch on the 2nd March 1765. They had 5 children – Solomon 1765 – 1848, Mary 1766-?, Nicholas 1768 – 1848, Samuel 1770-?, Sarah – 1771-?. 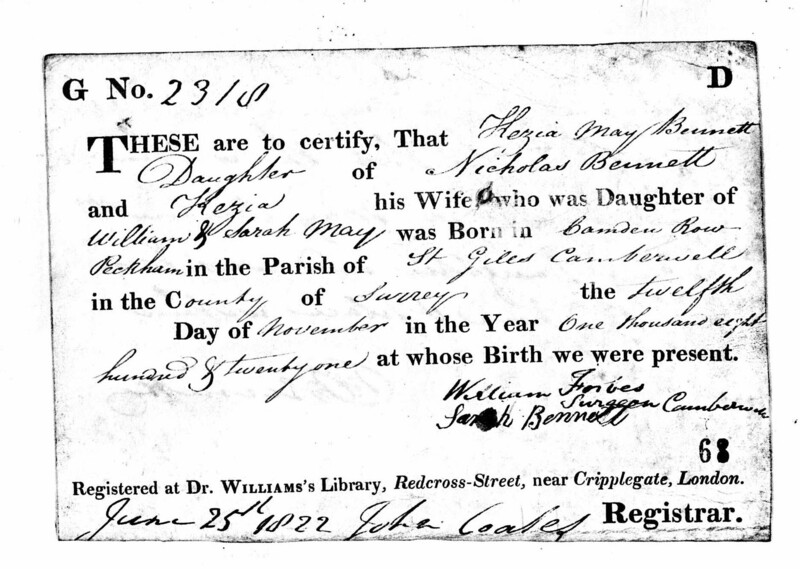 Solomon Bennett’s son Nicholas was born in Bethnal Green in 1768. 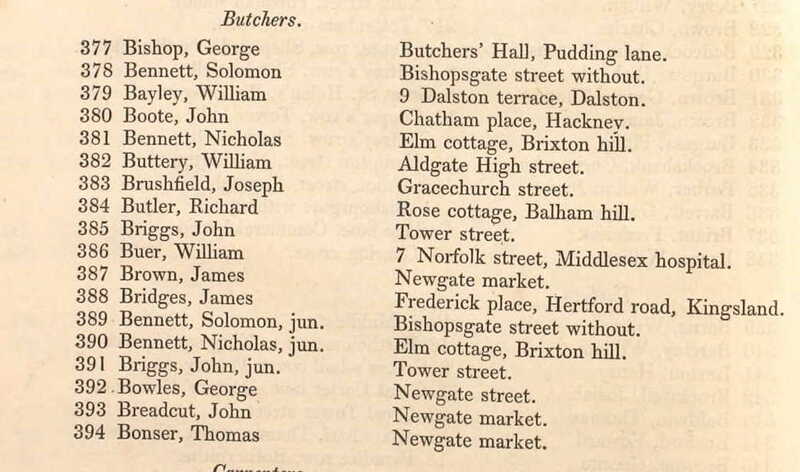 In 1783 aged 15 Nicholas becomes a butchers apprentice for 7 years. Around 1806 he buys land in Brixton. In 1820 a Nicholas Bennet marries Keziah May at St. Mary, Lambeth. This is probably the Nicholas Bennet jun. born 1893. Hezia May is born shortly afterwards. The 1837 City of London electoral register shows a Nicholas Bennett and Nicholas Bennet jun. of Elm Cottage, Brixton Hill as butchers. The line above lists Solomon Bennett jun of Bishopsgate Without. 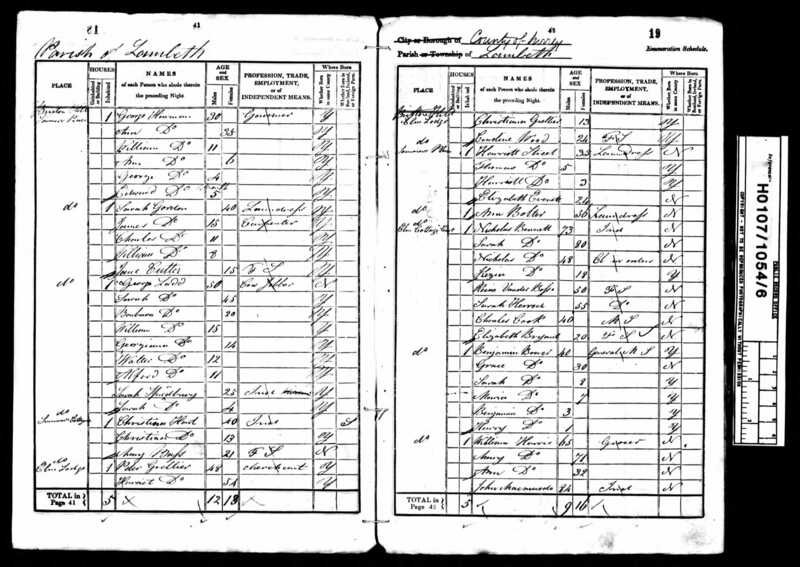 1841 census shows Nicholas Bennett (73) living in Elm Cottage (next to Somers Place and near Elm Lodge) living with Sarah Bennett (80, his sister? ), (Nicholas Bennett 48 born 1893, Cleric in orders) and Kezia May Bennett (daughter of Nicholas and Hezia May and 18 – born 1823), Reine Henrietta Vanderbosse. He gives ?? May living with Mr William May of no 4 Broad Street all the profits from his house in St George’s Road Southwark. 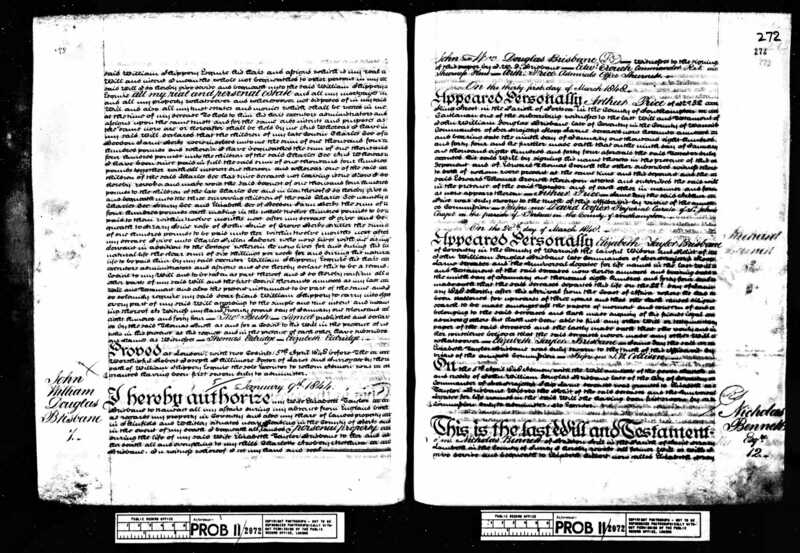 He gives Nelson Curtis (aka Nelson Bolter) of Elm Place Brixotn £500 and for the rest of his natural life the carpenters shop and premises that he now occupies. He also give Alfred Curtis (aka Alfred Bolter) £500. He gives to his late wife’s niece? Reine Henrietta Vanderbosse the sum of £100 and £20 per annum to be paid by the rent on premises in Brixton Place ??arket?? and also a small cottage now in the ?? of George Barton. He gives each of the four children (Samuel, Mary, Bliss and Nicholas) of his late nephew Dennis Bennett £100 pounds each when they reach 21. Ann Bolter gets £30pa from the rent on a house and premises in Brixton Place. Remains go to his son the Rev. Nicholas Bennett ??.??. of Queen’s College Cambridge. The Reverend Nicholas Bennett was born 1817 Male St Stephan’s, Cornwall, England. 1848 his father leaves him a house and land on which he builds Archbishops Place. 31 John E C Benett Head 40 1811 Male St Stephan’s, Cornwall, England – Governement High ?? South Villa is lower left of 1862 map below? The heiress Miss Cressingham did not remain a spinster for long. 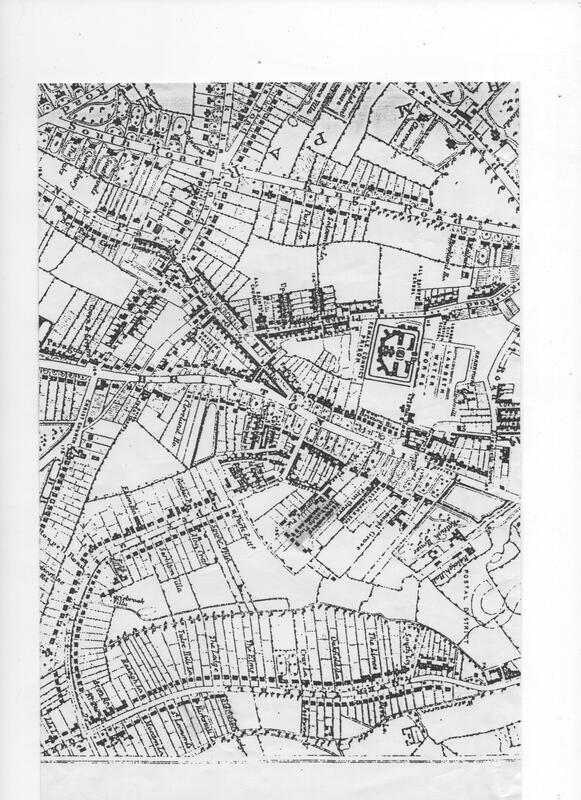 Her husband Dr Thomas Edwards, took the initiative in buying extra land to make an access from Brixton Hill in 1814 and laying out two new roads Lower Tulse Hill Road (now known simply as Tulse Hill) and Upper Tulse Hill Road (now Upper Tulse Hill) before 1821. The Edwards’ estate was, however, exclusively for the well-to-do. The land fronting the roads was divided up into plots of varying sizes, and was let on long leases of up to 99 years. Some of the lessees took several adjacent plots and assigned their interest immediately after the houses were completed; but the plots were more often leased singly, most of the houses on the estate being detached. All the leases contained safeguards for the preservation of the exclusive character which the estate was intended to provide. 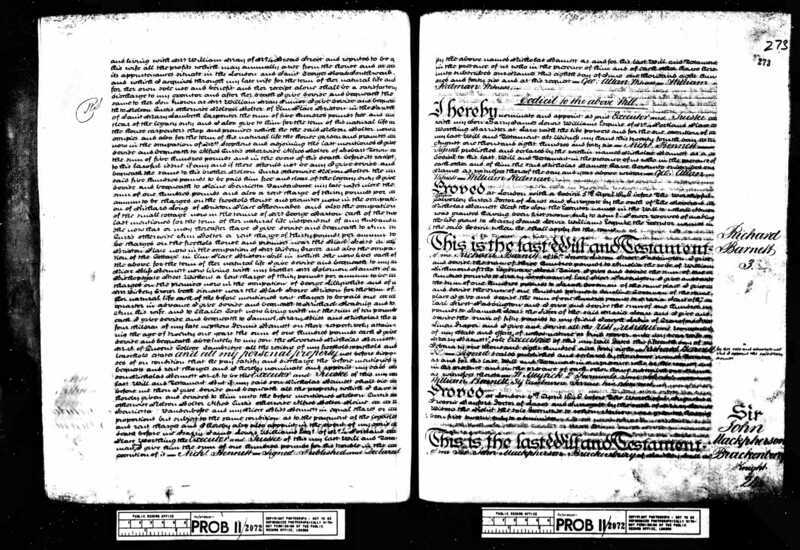 No house costing less than a certain figure (usually £700) was to be built, a minimum distance from the road was prescribed for each house, and no school, shop, trade or manufactory was to be established without permission; in some cases the lessee had to undertake to pay a reasonable share of the cost of making such drains and sewers as might be needed in the future. The Reverend Nicholas’ estate is only worth £300 on his death in 1875. It will be perhaps a surprise to many persons to be informed that the ancient fabric which is very generally supposed to be the _ . , parish church of Saltash has not been such until within the last few years, being in fact only a private chapel within the parish of St. Stephens-by-Saltash. The chapel, which is dedicated to St. Nicholas, was originally a cell belonging to the Priory of St. Germans, and its services were performed by the monks of that house. “We will now turn to the Registers themselves, the entries in which, from the cause already stated — St. Nicholas being a non- parochial chapel within the parish of St. Stephen — are very few.